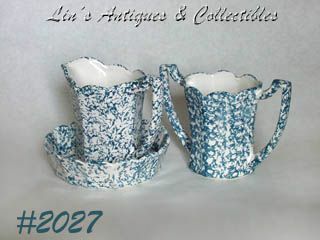 This is a pretty little pitcher and bowl set from McCoy's Strawberry Country Line! The pitcher measures 5 5/8" tall (at tallest). The bowl measures 2 1/8" tall and 8" diameter. These items have been in my personal collection well over 30 years -- display only so time to share! 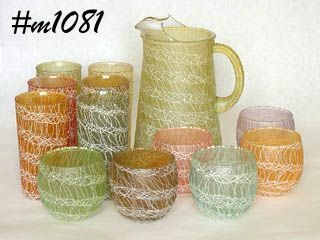 Listing consists of a pitcher (with ice lip), 6 tumblers (5 1/2" tall), and 6 juice (or Old-Fashioned) glasses that measure 3 3/8" tall. 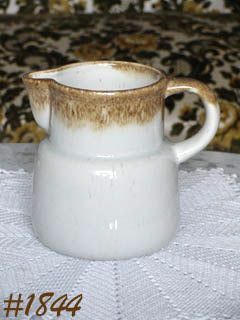 The pitcher is a soft green color. 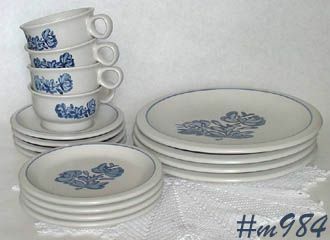 Super nice Pfaltzgraff dinnerware service in the Yorktowne pattern! There are 4 each: dinner plates, bread/dessert plates, saucers, and cups. Excellent condition -- very minor utensil marks -- of absolutely no consequence! McCoy's blue country dinnerware line is so pretty! This listing has a pitcher and bowl set and a matching vase/utensil holder (shaped like a large spooner). 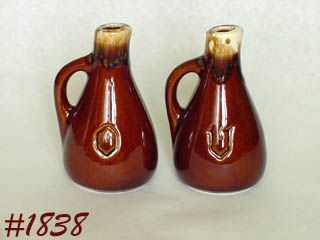 Pitcher measures 6" tall (at tallest), bowl is 2 1/8" tall, 7 3/8" diameter. Vase measures 5 3/4" tall (at tallest) and 4" diameter. 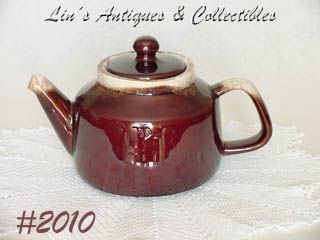 This is an excellent condition McCoy teapot from the pretty brown drip dinnerware line! Teapot measures 4 5/8" tall to rim and 5 3/4" tall to top of knob type handle. Bottom is marked: 163, McCoy, Lancaster Colony (mark), USA. The only evidence of "use" is a light glaze scratch on side that is of absolutely no consequence -- teapot appears to be unused! 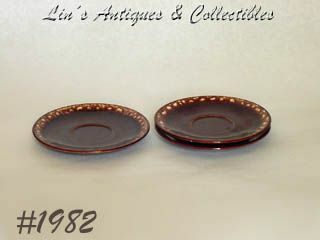 This listing has a rare find -- McCoy brown drip saucers! I only have three of these, they are from the Futura dinnerware line, and are marked USA. 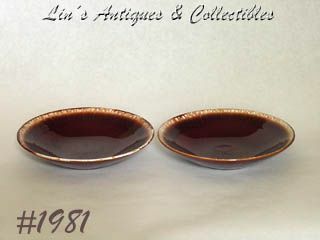 Saucers have stilt marks and each has a small glaze ding on underside of saucer rim. Still very pretty items and very very difficult to find! 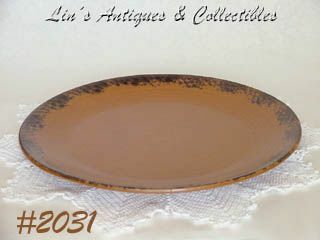 This listing has two brown drip bowls from McCoy's Futura dinnerware line! 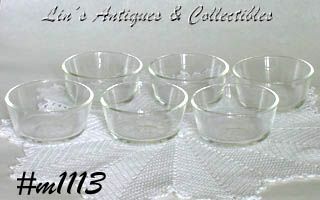 These are soup, salad, or small serving size bowls and are in great condition with minor utensil marks -- that's it! 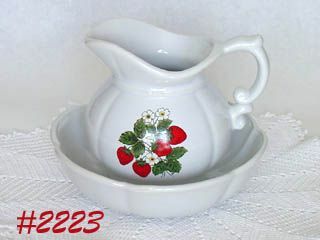 This listing has a super nice McCoy creamer and sugar with lid! 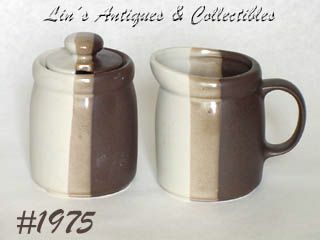 This set is from the pretty tri-color Sandstone dinnerware line and measure 3 3/4" tall. The creamer is marked 1414, USA. The sugar is marked 1414, McCoy, USA. Set is in excellent condition with no evidence of ever being used! 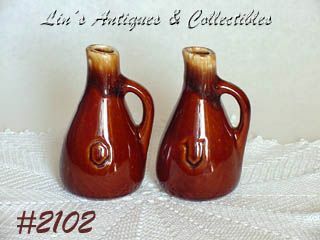 This listing has a beautiful McCoy pitcher from the Country Accents line of 1985! Pitcher is white with shiny glaze and has an in-mold goose (or duck) on front. Goose still has all his original cold paint! 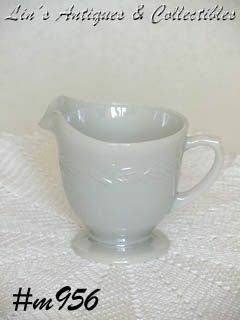 This listing has a very pretty McCoy creamer and covered sugar from the brown drip dinnerware! 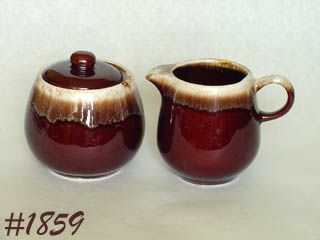 These are the more round shape, measure 3 3/4" tall, have shiny over-glaze, and are marked 7020, McCoy, Lancaster Colony (mark), USA. 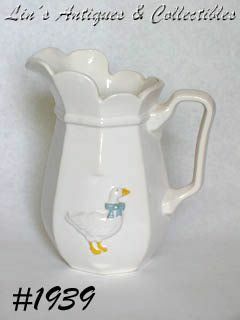 This listing has a pretty McCoy pitcher from the Graystone dinnerware line! Pitcher measures 6" tall and has beautiful colors. It is marked on bottom: McCoy, Lancaster Colony (mark), USA. Pitcher is in excellent condition -- no chips, no dings, no cracks, no crazing -- looks new ans unused! It has a tiny dot size production bubble on rim by handle -- of no consequence and not really worthy of mention -- just a typical tiny McFlaw! This is a very pretty McCoy cruet set from the brown drip dinnerware line! This is an unusual Frankoma find! 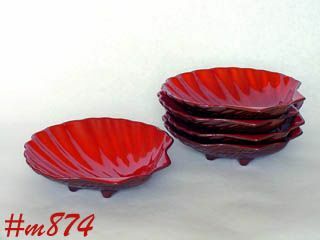 Listing consists of 5 shell shaped dishes/bowls, measure 6 7/8" long (at longest), 6 7/8" wide (at center). Marked: Frankoma, 473. Interiors are the flame red/orange color, exteriors are dark brown. Great condition -- no chips, cracks, or crazing! 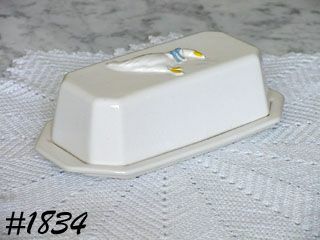 This listing has a covered butter dish from McCoy's difficult to find Country Accents line! Bottom is marked 2152, USA, measures 7 5/8" long (end to end) and 3 15/16" wide (at widest). Top measures 6 5/16" long, 3 1/8" wide and has in-mold duck (or goose) with blue ribbon around its neck. Both pieces are white with shiny over-glaze and have no dings, no chips, no cracks.